When I visited playgrounds as a child, I always raced to the spring animals before anything else. The slides, the swings, the monkey bars...I passed them all by in my mad dash to claim a spot on my favorite animal ride. I've no idea why they appealed to me so much, other than perhaps the imaginative possibilities they offered, as I can remember pretending I was riding them to some far-off adventure. I do recall desperately wishing I had one at home, and now, a few decades later, I do! 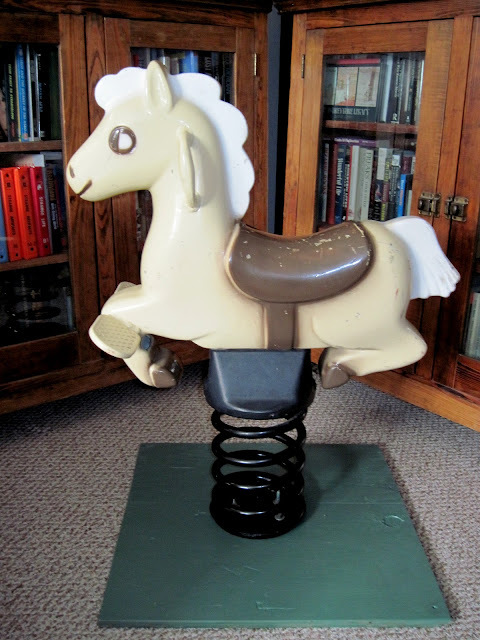 This vintage spring horse by Playworld Systems of Lewisburg, Pennsylvania is made of cast aluminum with a steel base, and measures 36 inches tall. In his original paint, he is a very cheerful palomino pony. The playground pony in his new habitat, the living room library. A small herd of spring animals has been slowly forming at my place. To see the first one I acquired (a duck), click here. Another is currently in restoration, and I'll post him once he's finished.